Maize (Zea mays) is one of the world’s three most important cereals along with wheat and rice. Maize is currently produced on nearly 100 million hectares in 125 developing countries and is among the three most widely grown crops in 75 of those countries. Although almost 80% of the maize grown worldwide is used as animal feed, human consumption in many developing and developed countries is steadily increasing. For example, maize is the most important cereal crop for food in sub-Saharan Africa and Latin America. Maize is believed to have been domesticated from teosinte (Z. mays ssp. parviglumis) in southern Mexico. Recent archeological evidence suggests that maize was present in the central Balsas near the Iguala Valley in Guerrero state, Mexico, 10,700 years ago. Further maize evolution and its expansion into other regions of Mexico and Central America followed, subsequently spreading from Mesoamerica to other parts of the world. The maize plant has wide adaptability to different growing conditions. Thus, it has become adapted and productive in all continents through introductions and breeding. Maize landraces exhibit significant morphological variation and genetic polymorphism and are grown from sea level to 3,800 masl. The genetic diversity of maize, being an outcrossing crop, is very broad. The major types of cultivated maize are characterised by their kernel types: dent, flint, floury, sugary, pop and morocho (a soft floury texture inside the grain, surrounded by a hard flint texture). Grain colours are white, yellow, purple, orange yellow, red, sun red, blue, mottled and brown. There are 300 or more races represented in the CIMMYT maize collection. Cultivated maize has two close relatives: Tripsacum spp. and teosinte. Although Tripsacum is morphologically very different, it is genetically related to maize. Tripsacum diversity is found extensively in Mexico and Guatemala as well as other countries in the Americas. Maize landraces are more variable than the landraces of any other crop species. Ex situ collections of maize diversity include landraces, improved populations, inbred lines, reference hybrids and genetic stocks of natural genes and transgenes as well as wild species. Some maize landraces have been displaced by modern cultivars while others are threatened as a result of modern farming and ranching practices. 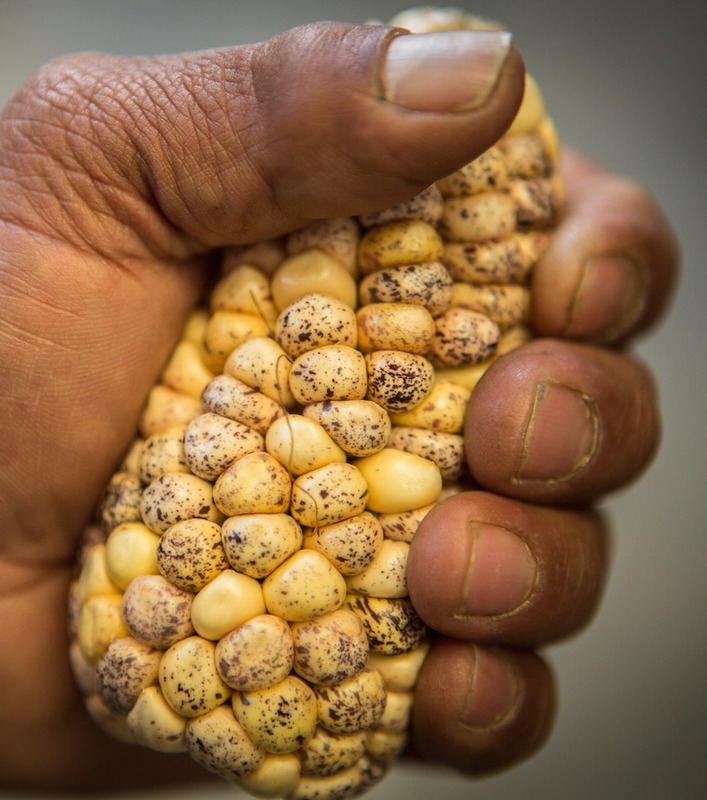 While local maize landraces can still be found in areas where Native Americans predominate, economic forces are often eroding the well-being of many small farmers, resulting in a reduction of the land area devoted to most landraces. Landraces and enhanced germplasm are the main objective of ex situ conservation by national and international maize genebanks. Maize seed stores well in conventional seed genebanks. Regeneration, however, can be time-consuming and costly, because it is important both to collect seed from an adequately large population and to prevent any loss of genetic integrity as a result of inadvertent cross pollination. 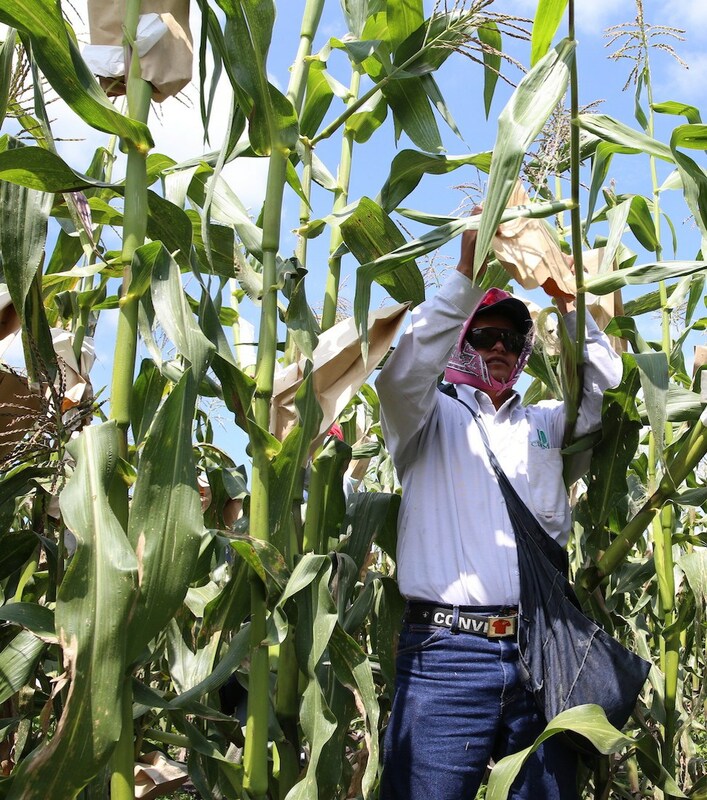 CIMMYT manages a field collection of Tripsacum spp., a maize wild relative. Tripsacum does not cross with maize, so there is no need for isolation. However, it can produce hybrid seeds when different accessions flower at the same time, making it necessary to clean seedling volunteers around the clones, to maintain genetic integrity. There are believed to be more than 135,000 accessions of maize crop diversity conserved worldwide. As befits a crop of such importance, many genebanks conserve maize diversity. One of the largest is CIMMYT in Mexico, with almost 30,000 accessions. Major collections (those holding more than 10,000 accessions) are located in Russia and USA (ARS). In addition to major germplasm collections, there is also the Maize Genetics Cooperation Stock Center at the University of Illinois (USA), in which various identified genes in maize are preserved in a specific genetic background. Brandolini A. 1970. Maize. In: Frankel OH, Bennett E, editors. Genetic Resources in Plants: Their Exploration and Conservation. F.A. Davis Co., Philadelphia. pp. 273–309. Dunn ME. 1975. Ceramic evidence for the prehistoric distribution of maize in Mexico. American Antiquity, Vol. 40, 3:305–314 Published by: Society for American Archaeology. Goodman MM, Brown WL. 1988. Races of corn. In: Sprague GF, Dudley JW, editors. Corn and corn improvement, third edition, monograph 18. American Society of Agronomy, Inc., Crop Science Society of America, Inc. and Soil Science Society of America, Inc. pp. 33–79. Matsuoka Y, Vigouroux Y, Goodman MM, Sanchez-G J, Buckler E, Doebley J. 2002. A single domestication for maize shown by multilocus microsatellite genotyping. Proceedings of the National Academy of Sciences. (PNAS) USA. 99:6080–6084. Contributors: CIMMYT, Mexico (Suketoshi Taba, Bonnie J. Furman), with inputs also received from IITA, Nigeria (Dominique Dumet); EMBRAPA (maize and sorghum genebank), Brazil (Flavia Teixeira); USDA (ARS/NC7, ISU), USA (Mark Millard). External reviewer: Major Goodman (NC State University, USA). Information on current practices for genebank management of maize was provided by partners from CIMMYT, IITA, and major maize genebanks including the USDA/ARS/NC7 (ISU, USA) and EMBRAPA maize and sorghum genebank (Brazil), as well as reviewed from literature and existing websites. Contact person: Denise Costich, CIMMYT, Mexico.